This small island is situated 35,5 nautical miles from Piraeus. Being one of the most beautiful islands of the Saronic, Poros attracts many tourists every summer. Beautiful beaches, lovely little houses, and mountains carpeted with pine trees present a brief description of the island. 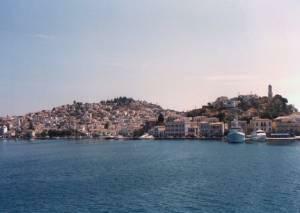 Poros is a volcanic island, created by the joining of Kalavria and Sferia, two pre-existing islets. It is located very close to Argolida in the Peloponnese, separated only by a very narrow channel that opens out at its western end into Neorion Bay, enclosed by splendid forested hills. This is where it owes its name, since "poros" means passage (compare to "pore" in English!). A canal divides the island into 2 parts. The major part, called Kalavria, is a limestone ridge rising to 390 meters (1279 feet); the minor section is a volcanic islet called Sferia, where Poros Town, the main port, is reflected in the calm waters of the strait opposite Galatas on the Argolic shore. Its homely character and its verdant countryside (pine, olive, and lemon groves) make Poros an agreeable place to stay, or from which to make excursions to the Argolic peninsula, noted for the lemon groves at Lemonodassos and the ruins of Trizinia, Epidauros, Tiryns, and Mycenae. Actually, crossing to the mainland is easily made by dozens of small boats continually transporting people from coast to coast. From Poros island you can make daily excursions to the Poseidon Temple (6th C. BC) and to the Monastery of Zoodohos Pigi. Visitors to this island are deposited at its bustling harbor full of cafes, bars, and restaurants. The island has two lovely beaches at Askeli and Neorio. At Neorio, one of the best sunsets can be viewed, where the visitor has the chance to see the "Kimomeni" or the "sleeping woman," which is the silhouette of the hills outlined by the setting sun, and is in the form of a woman lying down. Swimmers will find charming little sandy bays all along the way to Neorio, rimmed with pine trees sloping down to the sea. The approach to Poros by ferry is especially picturesque, and is a great place for lovers of scenic sunsets! A single, three-storey block overlooking the garden and large swimming pool, Vasilis Studios offers an inexpensive option for very nice self-catering accommodation on the island of Poros. This very basic self-catering complex offers 20 studios and apartments, plus a swimming pool and pool bar. It's a good choice for budget-conscious guests looking for an inexpensive getaway. Poros Panoramic View from the East. Argolis lies behind the photographer and to his left. Poros from the West: Photo taken from the top of a forrested hill sloping down to Megalos Neorios Bay.